روشندل کاهو, امین, سیاه کوهی, حمیدرضا. (769). تعیین فاکتور کیفیت با استفاده از تبدیل‌های زمان- مقیاس و زمان- فرکانس. مجله ژئوفیزیک ایران, 3(1), 19-32. امین روشندل کاهو; حمیدرضا سیاه کوهی. "تعیین فاکتور کیفیت با استفاده از تبدیل‌های زمان- مقیاس و زمان- فرکانس". مجله ژئوفیزیک ایران, 3, 1, 769, 19-32. روشندل کاهو, امین, سیاه کوهی, حمیدرضا. (769). 'تعیین فاکتور کیفیت با استفاده از تبدیل‌های زمان- مقیاس و زمان- فرکانس', مجله ژئوفیزیک ایران, 3(1), pp. 19-32. روشندل کاهو, امین, سیاه کوهی, حمیدرضا. تعیین فاکتور کیفیت با استفاده از تبدیل‌های زمان- مقیاس و زمان- فرکانس. 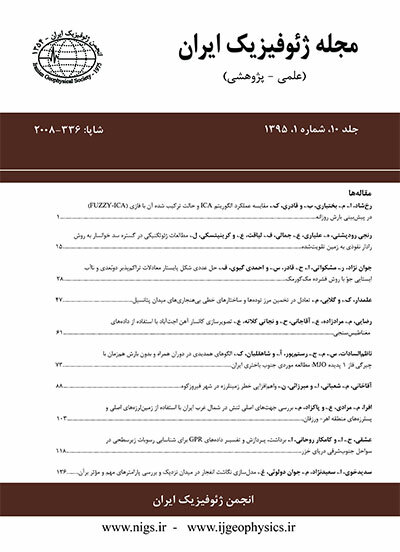 مجله ژئوفیزیک ایران, 769; 3(1): 19-32. در روش‌های مرسوم، ضریب میرایی امواج لرزه‌ای را معمولاً در حوزه فرکانس و بر‌اساس طیف توان و روش‌های آماری محاسبه می‌کنند. با توجه به محدودیت‌های تبدیل فوریه در تحلیل سیگنال‌های ناپایا، در این تحقیق با به‌کارگیری مرکز‌ثقل مقیاس و مرکز‌ثقل فرکانس و سه روش متفاوت برپایه ابزار ریاضی تحلیل هارمونیک‌ها (harmonic analysis)، فاکتور کیفیت (Q) برای داده‌های لرزه‌ای تعیین می‌شود. سه روش به‌کار‌رفته، براساس تبدیل موجک پیوسته با استفاده از موجک مادر مورلت بهبود یافته، توزیع ویگنر- وایل نمای هموار‌شده (smoothed pseudo Wigner-Ville) و شکل بازچینی‌شده (reassignment) این توزیع هستند. کارایی روش‌ها روی داده‌‌های لرزه‌ای مصنوعی و واقعی بررسی شده‌اند و نتایج به‌دست آمده حاکی از موفقیت آنها در نیل به این هدف است. از میان روش‌های پیش‌گفته، دقت شکل بازچینی‌شده توزیع ویگنر- وایل نمای هموار شده از سایر روش‌ها بهتر است. Seismic waves lose energy by traveling through the earth. Attenuation refers to the loss of energy which is caused by parameters other than geometrical spreading, and depends on the characteristics of the transmitting medium. Generally, attenuation is determined by quality factor (Q) which is a dimensionless parameter and has a reverse relation with attenuation coefficient. Experiments show that seismic wave quality factor depends on the fluid content of formation and its elastic properties. Hence, quality factor (Q) (or attenuation) is one of the most important attributes in seismic exploration used as a direct hydrocarbon indicator. Attenuation coefficient is usually calculated in frequency domain based on power spectrum and statistical methods. Because of the Fourier transform's limitations in analyzing non-stationary signals, this paper proposes an approach using three different harmonic analysis methods and two different attributes, namely the centroid of scale and the centroid of frequency, to determine the seismic quality factor (Q). The three methods consist of the continuous wavelet transform (Mallat, 1999) with modified Morlet wavelet, the smoothed pseudo Wigner-Ville distribution, and the reassigned form of the smoothed pseudo Wigner-Ville distribution (Auger and Flandrin, 1995). Because the Wigner-Ville distributions are energy distribution type, they were used in this study to determine the seismic quality factor. Since both the traditional Wigner-Ville distribution and pseudo Wigner-Ville distribution suffer from cross terms, the smoothed and reassigned forms of them were implemented to overcome the cross terms. Smoothing extends the auto terms in Wigner-Ville distribution which is not desirable for the purposes of this study. Therefore, by using the reassigned method we solved the problem of auto terms extension in the smoothed pseudo Wigner-Ville distribution. According to the results of this study, the reassigned smoothed pseudo Wigner-Ville distribution indicates fewer cross terms than traditional Wigner-Ville and provides better resolution than smoothed pseudo Wigner-Ville distributions. where is the centroid of scale, is time, is the modulation frequency, and is the quality factor. For a band-limited seismic wavelet, the estimated quality factor using Equation (1) differs from the true value. In such cases, there will be a relative reverse relation between the centroid of scale and quality factor as well as relative direct relation between the centroid of frequency and quality factor. Therefore, it is preferred to use the centroid of scale or centroid of frequency as a qualitative attribute for Q-factor determination. The efficiency of the introduced methods was investigated on both synthetic and real seismic data. The results showed that the quality factor estimated by the reassigned smoothed pseudo Wigner-Ville distribution method has better resolution than that of the other two transforms. Furthermore, the frequency-based results for the estimated quality factor show the low frequency shadow properties beneath the true position of the anomaly while the same results based on amplitude show the anomaly at its true position. Moreover, the results indicate that the existence of noise in the data do not affect the efficiency of the methods.